James Monroe was the 5th President of the United States who served in office from March 4, 1817 to March 4, 1825. What was the life of James Monroe like? The short biography of President James Monroe covers important information and facts about his early life, his family, career and the famous events and achievements of his political life. Our short biography of James Monroe provides an interesting and easy way to learn about the life of the President. The following important facts provide a fast overview of important facts about President James Monroe. Facts and Info: James Monroe was the fifth president of America and is best known for the "Monroe Doctrine." which stated that the United States would not allow European interference in the Western Hemisphere. For additional info refer to 20 Facts about James Monroe. Facts and Info: He was born on April 28th, 1758 in Westmoreland County, Virginia. His paternal great-grandfather immigrated to America from Scotland in the mid-17th century and his father, Spence Monroe, was a moderately prosperous planter He died on July 4, 1831 in New York. Facts and Info: The career of James Monroe included the roles of Soldier, Politician and Statesman. He had an excellent education and attended the William and Mary College after which he fought during the American Revolution. He became the fifth president of America in 1817 and served for 8 years until 1825. Facts and Info: James Monroe married Elizabeth Kortright. They had 3 children whose names were Eliza Monroe Hay, James Spence Monroe and Maria Hester Monroe. The marriage of Maria Hester Monroe to Samuel Lawrence Gouverneur was the first to take place in the White House. 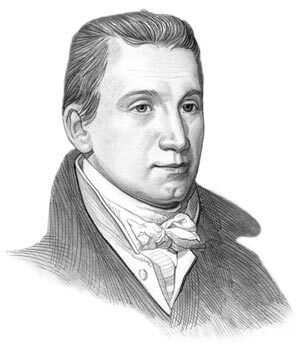 Facts and Info: James Monroe belonged to the Democratic-Republican Political Party. He was 58 years old when he was inaugurated as the fifth president. Daniel D. Tompkins stood as the Vice president. Monroe was the last president who was a Founding Father of the United States. The White House was painted white the year he became president. For additional facts refer to his Presidential Cabinet members. Short Biography of James Monroe: What he was like! Facts and Info: James Monroe was an imposing figure standing at 6 feet with “broad shoulders and a massive, raw-boned frame." The White House was still being rebuilt as it had been set ablaze by the British Army during the War of 1812. James Monroe sold his own furniture to the government because the White House was almost empty when he moved in. He enjoyed a lavish lifestyle and was frequently in debt. Facts and Info: James Monroe implemented the Monroe Doctrine in 1823 which declared against foreign colonization or intervention in the Americas. His presidency also saw the First Seminole War during 1817 and 1818 when American slave owners travelled to Spanish Florida in search of runaway African slaves and Seminole Indians who had been trading weapons with the British in the War of 1812. Facts and Info: During his life James Monroe was injured by a gunshot wound and suffered from seizures, tuberculosis and malaria. Tuberculosis is an infectious bacterial disease that primarily affects the lungs. It was also known as “consumption” or the “white plague” reflecting the deadly nature of the disease, which was the cause of more deaths in America than any other during the 19th century. Facts and Info: James Monroe died of debility, most likely tuberculosis, caught after the onset of a cold, and died on died on July 4, 1831 in New York. He was 73 years old when he died. James Monroe was originally buried in New York at the Gouverneur family's vault in the New York City Marble Cemetery but 27 years later the body was re-interred to the president's Circle at the Hollywood Cemetery in Richmond, Virginia. The short biography of James Monroe provides a fast overview of the key facts and events about his life and the accomplishments of his presidential term in office. The following James Monroe video enables you to sit back and listen to the history of his personal and political life - a useful educational resource for kids, children and schools learning about the life of President James Monroe.